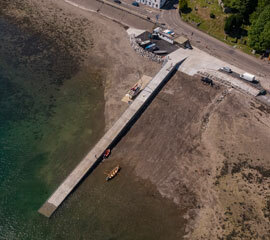 Ullapool Harbour Trust completed re-development of the village’s slipway in June 2018. 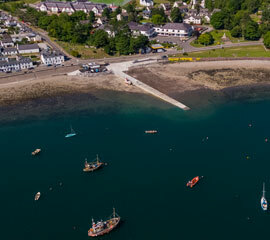 Located at the village entrance, the newly refurbished and extended jetty is a superbly improved base for both local community and visitors to launch boats and access Lochbroom together with enhanced facilities for local inshore fishermen. The jetty serves as a base for the local yacht club; it will also be a hub for the local coastal rowing fraternity. The work has resulted in a top class 100m slipway which is expected to significantly increase in popularity as a much-used local asset. Lybster-based Lochshell Engineering was awarded the contract in January 2018 and set to work widening and extending the structure using specially designed pre-cast concrete culverts designed by Dingwall-based Wallace Stone Marine Consultants. Much of the gravel, rock and cement used was supplied by local Ullapool Quarry. Despite tidal restrictions and some trying weather conditions, work continued apace to widen the jetty by 1.8m and extend it by a further 16.5m. It has also been heightened and the entrance and lay down areas have been improved. A newly constructed concrete plinth has also been added to facilitate local inshore fishing boats carry out anti-fouling and painting. A series of three rockpools has been installed at different tidal zones which will facilitate local marine enthusiasts of all ages to observe and learn about local sea life. 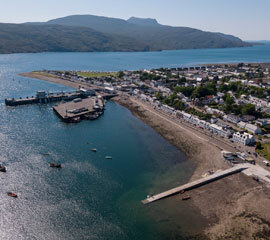 Ullapool Harbour Trust purchased the pier from Highland Council. The development was funded by Ullapool Harbour Trust (the main investor) with assistance from Royal Bank of Scotland, Highlands and Islands Enterprise and Highland & Moray European & Maritime Fisheries Fund Programme.